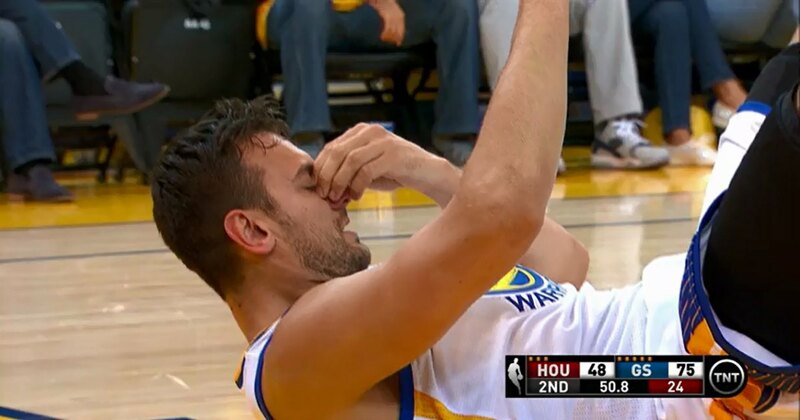 Golden State Warriors center Andrew Bogut will have surgery after he suffered a broken nose in the second quarter of Thursday’s 123-101 preseason win over the Houston Rockets. Rockets swingman K.J. McDaniels attempted a dunk and accidentally connected with Bogut’s nose on the follow-through of the miss. Bogut said he’s been down this road before. “I can’t breathe out of my right side right now," he said. “It’s the fourth time I’ve broken it. I have surgery tomorrow, afternoon I hope, or Saturday morning. But I’ll miss Saturday, probably miss Tuesday, and I’ll try to play Thursday with a mask in the final preseason game. Then I’ll be ready to go. Bogut, who is likely done for the preseason, finished with six points, four rebounds, two assists, two steals and two blocks in 11 minutes of action.